In 2017 Oral-B have launched the Pro 2 2000 (view on Amazon) and the Pro 3 3000 (view on Amazon). These are replacements to the Pro 2000 and the Pro 3000 being compared here, note the extra ‘2’ and ‘3’ in the respective product names for the newer models. The primary difference, is the new 2017 models come with a Li-Ion battery compared to the NiMH battery in the brushes we compare here. This doubles the battery life. It’s worth noting the Pro 2 2000 has directly replaced the Pro 2000. The former Pro 2000 listing on Amazon now redirects to the Pro 2 2000 listing. The comparison text and photos below still cover the old Pro 2000 and 3000 models, but should you click one of the Pro 2000 Amazon links, you will land on the Pro 2 2000 product listing. A comparison of the new models is available in our Pro 2 2000 vs Pro 3 3000 comparison. We recommend choosing one of the newer models if you are thinking of buying one of these brushes, or checking out the suggestions in our list of the top UK brushes. As with all our comparisons, we give you a quick answer first in case you’re in a rush, and then go on to explain our choice in more detail and provide a video comparison. In this post we are looking at the Oral-B Pro 2000 vs 3000. However, as noted above, the Pro 2000 has now been replaced by the Pro 2 2000, which is therefore shown in the table below. 2 excellent brushes with the Pro 3000 being the go to brush if you need the sensitive cleaning mode. The Pro 2000 is generally the cheaper option and will be the better choice if you are on a budget. When you come to buy, if there is a special offer running for the Pro 3000 but not the 2000, go for the Pro 3000. If neither brush is discounted, go for the Pro 2000. Pro 3000 is available in only one colour compared to the 2 colour options of the Pro 2000. The Pro 3000 comes with 2 brush heads compared to the 1 of the Pro 2000. 2 cleaning modes are available on the Pro 2000 compared to the 3 on the Pro 3000. Pro 200 generally cheaper to purchase, but not a lot in it. Detailed Comparison: What’s the difference between the Oral-B Pro 3000 and Pro 2000? Aside from the obvious colour difference of the rubber banding that runs down the front of the brushes, it is virtually impossible to tell the differences between them. What is often the cheaper (not always) Pro 2000 comes with either a pale blue or pink rubber colour option, whilst the Pro 3000 has a darker blue rubber option only. Both are the same size and weight and feel identical in the hand. Take a look at the box contents and you will find that the Pro 3000 does comes with 2 brush heads compared to the single brush head of the Pro 2000. The 2000 comes with a CrossAction head only and the 3000 comes with this and a Sensitive brush head which is ideally placed for its additional cleaning mode, more on that in a moment. Naturally a rechargeable brush requires a means by which to charge it, so both come with the standard Oral-B charging stand, but the Pro 3000 also comes with a small but useful white plastic frame which clips over and around the charging dock. On the rear are two protrusions; sit your brush heads on these when not in use. This is a nice little addition and makes for a neat storage option. 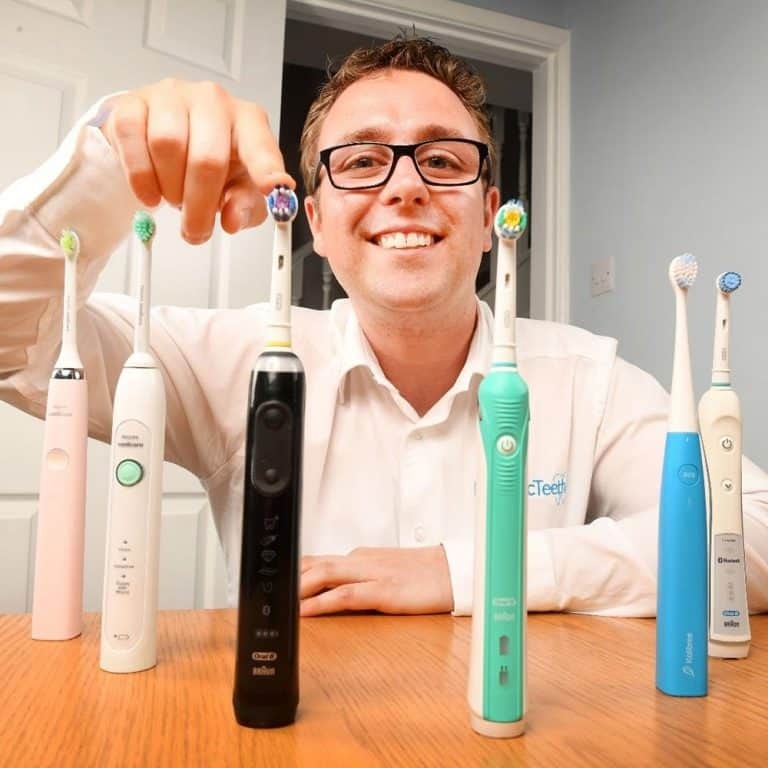 Either of the two electric toothbrushes compared here are going to do a pretty decent job of getting your teeth clean and that is the ultimate aim of any toothbrush. Many studies have shown how an electric toothbrush can actually offer a superior clean to that of a manual brush and what differentiates these two brushes primarily is the cleaning modes available. The Pro 3000 offers 1 additional cleaning mode over the Pro 2000, that addition is the Sensitive cleaning mode. Both offer the Daily Clean and Gum Care mode but it is the Pro 3000’s Sensitive mode that might make this the better choice for you. Allow me to briefly explain how these cleaning modes vary and why the 3000’s sensitive mode might be for you. Any toothbrush relies on movements of the bristles on the brush head. With the Daily Clean mode on any Oral-B brush this formed through 8,800 oscillations and 40,000 pulsations. The Gum Care or Massage mode as it is often known drops this down to 2,600-8,800 oscillations and 12,000-40,000 pulsations whilst sensitive mode offers 6,500 oscillations and 30,000 pulsations. Pair this with the sensitive brush head included in the box, which has been engineered to be softer on the teeth and gums. This is particularly useful is you have inflamed or sensitive areas of the mouth. Sensitive mode is very similar to Gum Care, but more focused on the teeth than the gums and the gum line alone. It is not essential to use the provided sensitive brush head, but advisable. As both brushes are part of Oral-B’s Pro series, there is the option, should you wish to change the brush heads at any time to one of a series of different brush heads offered by the company. 2 other specialist heads also compatible include the Ortho and Interspace/Power Tip. Each brush head has advantages and disadvantages and are engineered to work better with certain cleaning modes. We have created a detailed ‘Oral-B brush heads comparison‘ post, or the following table summarises each. No. The clean offered by each brush is identical. The only differentiator is the one additional cleaning mode, Sensitive, offered by the 3000 which; as explained earlier, may be better suited to certain users due to the reduced power and number of oscillations, serving better those with more sensitive teeth. If it is a case of getting the ‘newer’ brush because that will be better then you are out of luck. Both of these Pro series brushes became available during June of 2014, so neither is newer or more current than the other. Both models have a built in pressure sensor which will illuminate when the brush detects too much pressure being applied to the teeth. Some may consider this a gimmick, but it is a feature both boast and this is known as ‘sound connectivity’. With Oral-B app downloaded onto your iOS or Android device, when the app is open, your smartphone will listen for the sound of the brush. As it does, it begins a timer on screen and logs your clean in the app. Both have built in timers to assist with the 2 minute clean along with a quad pacer that alerts you to the 30 second intervals. Both have a 7 days battery life (based on one user cleaning twice a day for 2 minutes) and both give you a warning of the battery status via a colour coded illumination of the battery icon. As you would expect, the two come with a standard 2 year warranty which can be extended to 3 years, if you register the brush online. Generally speaking, the Pro 2000 is the cheaper of the two brushes. At the time of writing the Pro 2000 is available for about £35* and works out at about 7p per day whilst the Pro 3000 is £45*, but can be found at the same price as the Pro 2000, thus working out at just 7p per day too. Just be careful to pick the retailer offering the price you are happy to pay. As mentioned above, the Pro 3000 (see it here on Amazon) is the brush we would choose out of these two, but the Pro 2000 (see it on Amazon) is a very worthy alternative, and really it depends on which one has the best deal when you come to buy. At the time of writing the Pro 2000 is available for £35 online whilst the Pro 3000 is £45. ​*Please note any prices stated below were correct at the time of writing and may have changed by the time you come to buy. We always recommend checking the prices of several retailers before you make a purchase. An absolutely excellent review. Very clear and informative. I particularly like the summary at the start. Thanks Michael. Glad you found it useful. I have just bought the 3000 partly because I wanted Gum Care which is a MASSAGE function that pulsates at various speeds to stimulate blood flow in the gums. Gum care mode is different to Sensitive mode. This seems to have been missed in your review and missing on a number of reviews elsewhere. Oral B recommended using the sensitive brush head in gum care mode ( also in sensitive mode as mentioned in your review.) By the way, I don’t think that the 2000 has Gum care mode but it does have Sensitive mode. I phoned Oral while deciding which to buy – the 3000 is more expensive partly because it has gum care massage. Thanks for the comments, it seems you have found the brush that is ideal for you, which is great. We do not explain the different cleaning modes in detail in this post as we are comparing more than just this here. On our site we do have a post dedicated to explaining the different cleaning modes availale, you can read that here. We can confirm that the Pro 2000 does have Gum Care mode as confirmed by their own website here. When you have been using the 3000 for a little longer, please do let us know more detailed thoughts and opinions on it. My dentist has just recommended the Oral B 2000 electric toothbrush with sensor but I found a Oral B 2000 on sale in Debenhams but it doesn’t mention the sensor aspect. Not sure why I need this aspect or what it does. Do you know? The Oral-B Pro 2000 should come with a pressure sensor as standard. We are not aware of a version without it. With a brush that has a pressure sensor, during any cleaning cycle if you apply too much pressure (brush too hard), the pressure sensor will illuminate red to indicate that you need to decrease this. The brush automatically reduces the speed of the brush head to reduce the risk of doing damage to the teeth of gums. After a short while you get used to the cleaning cycle and what pressure is required, but it is a good visual aid to stop doing more damage or brushing too hard. The Pro 2000 is an excellent choice. You can read more about it here in our review as well as see hands on images. Thank you for review and comparison, I own a Pro 3000, which the whole family love, and I wanted to buy a pink one for my wife, your review has saved me ages looking for a pink one, so it’s a pink Pro 2000 then. The review of the mode was also useful as I didn’t know which would be missing on the pro 2000. Thanks for the feedback. Glad we could held. Which one did you go for? excellent help, there is so much choice out there and your guide has been the most useful tool so far. many thanks!! Thank you for the feedback. It is appreciated. I think that’s the difference as I’m in the US. Here’s a link to a Costco site that carries it. It shows the Sensitivity Mode. That would explain it Dan. 🙂 That looks like a pretty good deal on the Costco site. 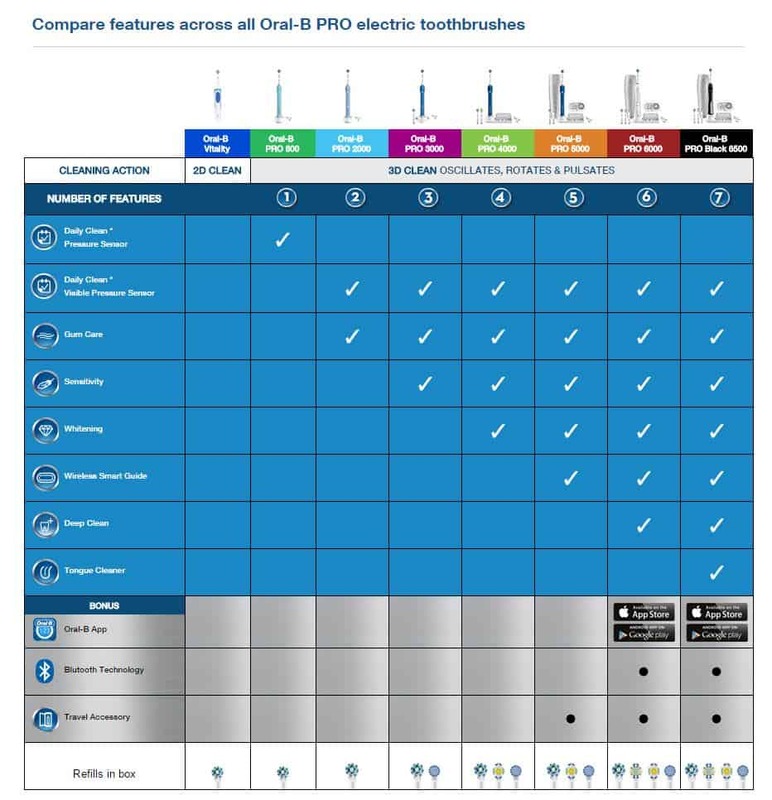 I have checked Oral-B’s US website and they are not listing that model, whether it is older or simply has not been added to their site I am not sure, but you can see the range here: http://oralb.com/en-us/product-collections/electric-toothbrushes . If you need any further help let us know. If you do decide on a brush, once you have begun using it, please let us know how you get on. Are you sure the Pro 2000 does not have the Sensitive Mode? I have seen packaging on other sites and it says Sensitive Mode.